It is essential to have adequate attic insulation for many reasons. For instance, did you know that you could be losing a great deal of money every month on your heating and cooling bills, simply because you have inadequate attic insulation. 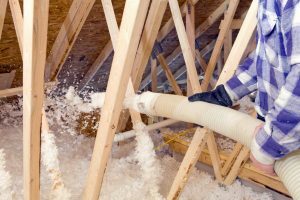 Rogers area homeowners have been entrusting their all-important attic insulation to the experts at Lewis Insulation for many years. Not only are we experts on attic insulation, but we are also trustworthy and honest. You will never have to second-guess if you came to the right place for attic insulation when you call us. Proper and adequate attic insulation can benefit you in a number of ways. Not only could you see some savings on your heating and cooling bills, but you could help the environment as well. Buildings emit greenhouse gas emissions, and the best way to reduce these emissions is through proper insulation. We will be happy to tell you more about these types of attic insulation. Keeping your budget and your specific needs in mind, we can recommend what kind of insulation you should have installed. All of these insulation choices are cost-effective and a great way to keep your house cool in the summer and warm in the winter. Give us a call to hire our attic insulation contractors to come to your home for a thorough and efficient insulation installation. Attic insulation can help with a variety of issues from noise pollution to moisture problems. Make sure you get the most out of your insulation and reap all of the benefits of attic insulation and only trust the professionals. For more than 35 years, homeowners have relied on us to provide the best and most up to date insulation materials for their homes. We know the best and most efficient ways to install the insulation, and we take care of installing this insulation safely and properly so you don’t have to. Call us to get on our schedule or to get your free estimate. Our attic insulation contractors can come to your home, assess your needs and give you an estimate so you know exactly how much to budget for. If you would like to learn more about attic insulation in Rogers, call Lewis Insulation at 763-477-2612 or you can schedule a Free Estimate.